Most personality profiles focus on behaviors because they are observable and easy to document. Knowing the core motivation behind behaviors is far more significant in assessing and understanding the person. Gerry uses this assessment with her Executive Coaching clients as a tool to provide a deeper understating into their innate strengths and limitations and to provide insights on how they may relate more effectively with others. RED (Motive: POWER) – These are the power wielders. Power: the ability to move from point A to point B and get things done, is what motivates and drives these people. They bring great gifts of vision and leadership and generally are responsible, decisive, proactive and assertive. BLUE (Motive: INTIMACY) – These are the do-gooders. Intimacy: connecting, creating quality relationships and having a purpose, is what motivates and drives these people. They bring great gifts of quality and service and are generally loyal, sincere, and thoughtful. WHITE (Motive: PEACE) – These are the peacekeepers. Peace: the ability to stay calm and balanced even in the midst of conflict, is what motivates and drives these people. They bring great gifts of clarity and tolerance and are generally kind, adaptable, and good listeners. YELLOW (Motive: Fun) – These are the fun lovers. Fun: the joy of living life “in the moment”, is what motivates and drives these people. They bring great gifts of enthusiasm and optimism and are generally charismatic, spontaneous, and sociable. 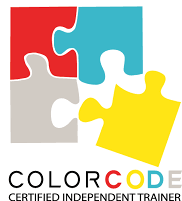 ColorCode Workshops are a great way to improve communication skills and professional relationships within a team. 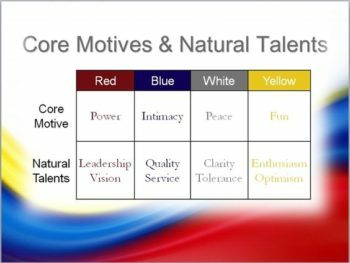 In Color Code workshops, your team will increase interpersonal skills by using the very powerful ColorCode theory. Participants develop increased levels of self-awareness which is a key element in developing Emotional Intelligence. If you would like to learn more about Color Code Assessments or request a workshop for your team email Gerry.